The entire Lost Lands campaign is usually described as “Dark Medieval," and this is a bit about what that means. To me, at least. If you're a fan of what I'm talking about in this post, you should definitely go and check out the Kickstarter, which is running now (until Nov 15, 2015). Basically, Frog God Games offers a “film noir” version of escapist fantasy, in contrast to Tolkien’s epic and folkloric approach to the same genre. Our adventures tend to have lots of horrific elements underlying the apparent reality, which is why you’ll often see us saying, “All is not as it seems” when we’re talking about the Lands. Where the Forgotten Realms have a strong tendency toward high fantasy and heroism, our world is a bit … well … ickier. One of the strong themes of the campaign is that beneath the civilized veneer of things, there is actually a seething mass of rot, evil, heresy, and supernatural threat. 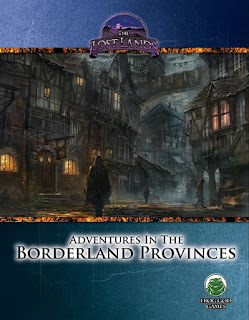 Again, “all is not as it seems.” The Borderland Provinces campaign book, as a supplement, has more focus on the actual veneer than an adventure book. What does the “normal” world look like when I’m not in one of these dungeons? So there is a lot of material about culture, history, trade, and government that would be a bit boring if it weren’t for the fact that it’s written in a way to best drive the game master’s creativity about what kinds of adventures arise from that context. And of course, it also reveals a lot of information about what’s beneath that veneer, a peek into the aforementioned seething mass of rot, evil, heresy, and supernatural threat. The Adventures in the Borderland Provinces book, of course, is all about the dark underbelly and nothing about the veneer. I'll have more to say about that book later. If you’re interested in the sort of fiction driving this “dark medieval” world of ours, we can point to a few influential sources for those who are curious. Another “film noir” fantasy author is Jack Vance. In particular, the Lyonesse books and the Dying Earth books are good examples of noir fantasy. The Lyonesse books are a strong influence on Matt’s Borderlands. Vance takes what appears to be a fairly light-hearted fairy tale world, but spins an extraordinarily dark view of its inhabitants. For Vance, the underlying horror isn’t the supernatural underpinning of the cosmic world, as it is for Clark Ashton Smith. For Vance, the underlying horror of a world is the people who inhabit it. If you haven’t read the Lyonesse books, be warned that many people find the entire first half of the first book to be tedious. After that, the pace picks up to an almost breakneck level, though. The books are Suldrun’s Garden, The Green Pearl, and Madouc. There are some great examples of noir fantasy from a later period, and one of the greatest is Glen Cook’s Black Company series of novels. All of these are excellent, although there are rather a lot of them. The first three are generally called The Books of the North: The Black Company, Shadows Linger, and The White Rose. Cook’s fantasy world is very bleak and quite terrifying, seen from the perspective of some people who are seriously out of their league and watching their options dwindle away rapidly. 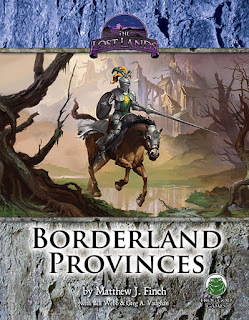 We're launching Lost Lands: Borderland Provinces Kickstarter today! The Borderlands are the campaign world containing Rappan Athuk and the Lost City of Barakus, plus several other Necromancer Games books from the d20 era. Not only that, it also links up the long-awaited northwest route from these areas to the city of Bard’s Gate, and ultimately connects Bard’s Gate to the campaign area described in Cults of the Sundered Kingdoms and the Domain of Hawkmoon. A bare-bones pdf resource for the campaign is $12 (although this is only for a very do-it-yourself DM). The main campaign book is $35 plus shipping, and there are also tons of additional resources that can be added like an a la carte sort of menu. I wrote this one based on outlines from Greg Vaughan's canon of Necromancer Games, and I'm really hoping that the lower price-point (which I really pushed) and the centrality of the area will make this the biggest Kickstarter we've ever done. It's also the first setting material that we've done for 5e as well as PFRPG and S&W, which I think will interest a lot of people.